Koei Tecmo cross-over action game dated. 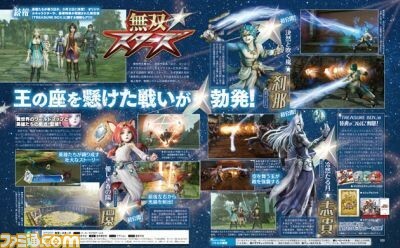 Musou Stars will launch for PlayStation 4 and PS Vita in Japan on March 2, 2017, the latest issue of Weekly Famitsu reveals. The magazine also confirms that Wang Yuanji from Dynasty Warriors, Horo from Toukiden, and Mitsunari Ishida from Samurai Warriors will be playable in the game. Three original characters—Tamaki, Setsuna, and Shiki—are also revealed. As announced yesterday, Koei Tecmo will debut the first live gameplay of Musou Stars during a Famitsu live stream on Niconico this Thursday, December 1 at 21:30 Japan time. Update 7:20 p.m.: The PlayStation 4 version of Musou Stars will cost 8,424 yen and the PS Vita version will cost 7,344 yen. A Treasure Box limited edition including a soundtrack CD, visual book, school calendar, and steam cloth poster will be available on PlayStation 4 for 13,824 yen and on PS Vita for 12,744 yen. Tamaki – The ruler of the next era of other world and the girl who was told the prophecy. She is the ringleader who summoned a hero to the other world. She fights using a “Flash Mirror” and specializes in long distance attacks. Setsuna – The son of the long-reigning king and Shiki’s cousin. He calls himself the true heir to the throne. He fights using a “Heavenly Sword,” the light of which extends his reach. Horo (voiced by Haruka Terui) – She is from the Toukiden series and specializes in gun use. She can rapid-fire her gun and may also be able to fire beams. Wang Yuanji (voiced by Kanae Ito) – She is from the Dynasty Warriors series and can attack using many moves. She also has new actions, such as using her knives to bounce back other knives. Mitsunari Ishida (voiced by Eiji Takemoto) – He is from the Samurai Warriors series and can use his folding fan to make explosions. World Map – You can choose a battle to clear on the world map, and the story advances by clearing key battles, but there are also other battles such as “Hero Battles” where you gain more allies, “Dramatic Battles” where you fight against many heroes, and “Field Battles” where you freely fight. Hero Skills – The four characters that aren’t the player character can also use Hero Skills. The skills will act as support the player. Musou Fever – Musou Fever shines the spotlight on the character. The player’s ability increases, as does support from the four ally characters. Friendship Levels – Each character has a Friendship Level. As this level increases, support attacks are more likely to be triggered and events will occur.